Last year's discovery of gravitational waves rocked the field of astronomy, and since then, researchers have pored over the strange signals that came from distant black holes colliding. And they just noticed the following: some black holes outside our galaxy are spinning around in strange patterns, and no one's sure why. 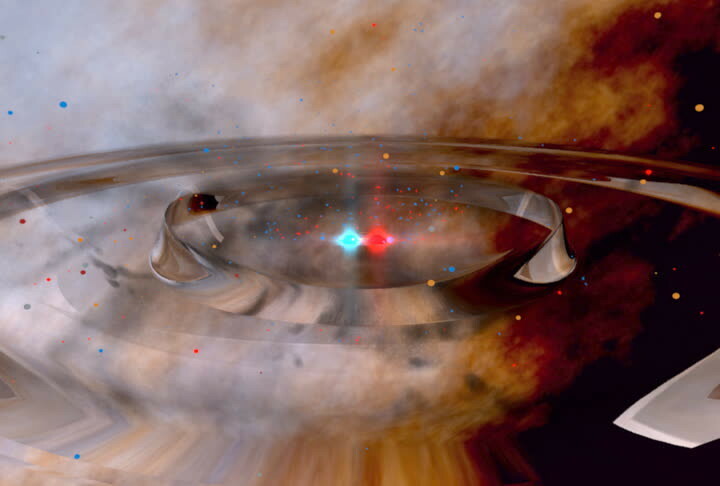 Following the activation of the Laser Interferometer Gravitational Wave Observatories (LIGO), which allows scientists to monitor faraway stars outside our galaxy, some very unusual readings have been found regarding the way some distant black holes interact with each other. Gravitational forces suggest that pairs of black holes are spinning around in tandem, for reasons that aren't entirely clear yet, but which could help us to gain a greater understanding of the Big Bang. "No matter what happens, they don't look like the ones in our galaxy. It will be weird and exciting." With pairs of black holes orbiting each other as they spin, the scientists behind this new study (who published their findings in Nature) want to determine just how they ended up circling each other, and there are some different possibilities. Either by complete coincidence, two stars that were already in orbit around each other both imploded into black holes at the same time, or, even more excitingly, this could be the result of one black hole getting caught in the gravitational pull of another, in an instance of a kind of black hole nursery that's unlike anything we've seen in our own galaxy. An alternative school of thought suggests that these pairs of black holes may have formed all the way back at the time of the Big Bang, which is something that astronomers may be able to determine by analysing the speed with which the black holes spin - if they're going extremely slowly, it may be an indication that they've been spinning for a very, very, very long time. Ultimately, though, whatever's going on with these endlessly twirling pairs of black holes, we don't have all the answers yet. There's plenty more to learn from the data that the LIGO can provide about celestial bodies outside of the Milky Way, and for those involved in the studies, it's going to be a lot of fun figuring out exactly what's going on. "By presenting these two explanations for the observed behavior, and ruling out other scenarios, we are providing those who study and try to explain the formation of black holes a target to hit. In our field, knowing the question to ask is almost as important as getting the answer itself." Just imagine how awful it must be for local spacefaring life forms, should there be any - you think you've managed to miraculously get away from the gravitational pull of one black hole, only to get pinned by another one. That takes the idea of being stuck between a rock and a hard place to a whole new extreme.